I don't want it said that this blog doesn't own up to its mistakes so I'll just say it; I got the Cory Spinks vs Sechew Powell call wrong. Yesterday I told you Powell was going to have too much power for Spinks and I hope you didn't lay a bet down on a Powell KO, because if you did I'm going to have to start putting on a disclaimer. I got the other fights right - Ruslan Chagaev vs Kertson Manswell was easy to call in favour of White Tyson and prospect Carl Frampton did what he was supposed to with a knockout over Kris Hughes. The problem was those predictions never made it to print, so you'll just have to take my word for it. Let's have a look at last nights action. First Ruslan Chagaev. We last saw the heavyweight fighting for the WBA's toy title against Alexander Povetkin. 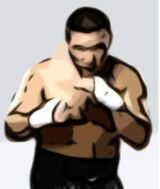 Although he's been a world champion before, Chagaev (28-2-1) has never been an elite threat to the heavyweight division. He's a popular guy and won a lot of fans when he became the first person to beat Nicolai Valuev in 2007, but he's a 7-7.5 out of 10 fighter at best. Last night he was trying to show us that at 33, and with two losses in his last five, he still has something left. Turning up to the ring out of condition wasn't the best start, but Chagaev gave us a good performance. Yes, Kertson Manswell is becoming a heavyweight fall-guy, but Chagaev scored a comfortable win and it's obvious he still has something left. If I was to play promoter I'd match him up with Tyson Fury; the UK heavyweight loves to fight overweight, on the wrong-side-of-their-peak guys, but Chagaev might have what it takes to beat him. Fury would be a great scalp for the mantelpiece. Four hundred miles away an Irish kid was out to prove he's worth the hype thrown his way. An 11-0 record and the tutelage of Barry McGuigan had us talking about super bantamweight prospect Carl Frampton, and last night was his Sky Sports coming-out party. His opponent, Kris Hughes, talked up his game and ring-walked to the adrenaline-pumping The Omen by The Prodigy, but he turned out to be nothing but a shadow for Frampton to look good against. Hughes threw a weak jab and tried a couple of combinations but he didn't have the power or conviction to hurt Frampton. Carl kept a cool head, waited for openings in Hughes' defence and landed body blows whenever he chose. He ended the fight with a brutal knockout in the seventh, one of the most stunning this year in boxing, and he did enough to keep the hype express running through his station. My criticism is that he could have had Hughes out of the ring earlier. Frampton has something, but let's not call him a super-prospect yet. Let him settle his domestic rivalry with Scott Quigg and then we'll see what kind of talent he has. The main event in America was an IBF title eliminator between Cory Spinks and Sechew Powell. My prediction skills might have sucked last night but Spinks' boxing didn't. The thirty-three year needed to show us he still had champion quality after losing four of his last eight, including one to IBF champion Cornelius Bundrage, and he did it. With is father in his corner and the Missouri crowd watching, Spinks (39-6-0) outpointed Sechew Powell and gave legitimacy to his boxing comeback. A reader of this blog pointed out how wrong I'd gotten the prediction (I was hoping to let it slide), but he also said he feels Spinks is back to his best. After last night, FMMFan, you might be right. Do you fancy doing our predictions next time? It was a great night of boxing but there's more to come in February with Donaire, Chavez Jr, Cunningham, Berto, Ortiz, Vitali, Broner and Maidana all getting into the ring. Hope to see you back on Punchbag Blog to talk about it.